*Would you like wooden or Plastic Incubating Trays? *Would you like a Hatching Basket for the 1st shelf? *Would you like a Hatching Basket for the 2nd shelf? *Would you like a a Hatching Basket for shelf 3? The HEKA Favourite 216 has a capacity of up to 216 hen eggs, or 243 if you use the plastic trays. The reliable computer-controls feature a high- class functional range. Temperature and humidity are shown so that you can check the precise regulation of your incubator at any time. On the other hand, temperature, humidity, turning and cooling can be programmed with just a few key presses. All incubators in the HEKA Favourite Series are equipped with double glazing. The insulation value is much better in comparison with single glazing, and uses less energy. Also, insulated glazing does not begin to steam up until higher than ~80% humidity, and higher values are not normally required. Wooden trays feature a favourable price - because they are made of moisture-resistant (sauna)wood. These trays last for very many years with perfect stability and without becoming deformed. The plastic trays offer in addition the advantage of a hygienic easy-to-clean surface, of particular importance when our incubators are used in laboratories and research facilities, but also important for brooders, who are keen on cleanliness. Because the plastic trays are produced with a smaller frame yet achieve the same stability, they have a 15% higher capacity. 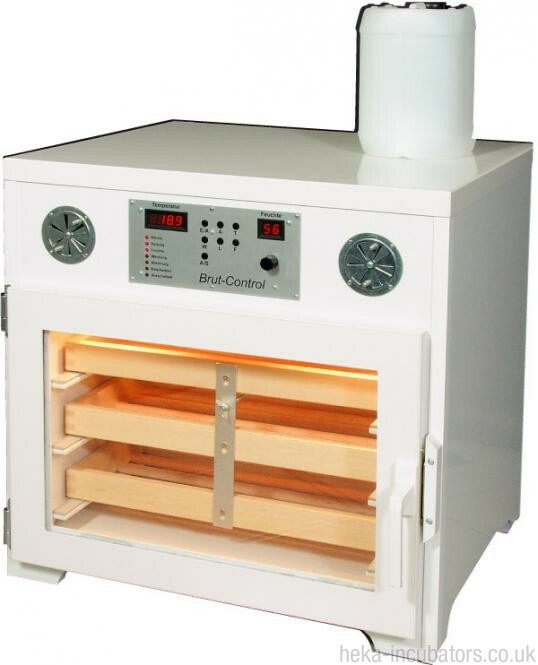 The incubator is equipped with the following as standard; an interior light, three wooden incubating trays of your choice, a water canister, a detailed manual and different connectors for turning any quantity of trays.